Denel SOC Ltd. is a state-owned commercially-driven company and strategic partner for innovative defence, security and related technology solutions. It groups together several defence and aerospace divisions and associated companies. 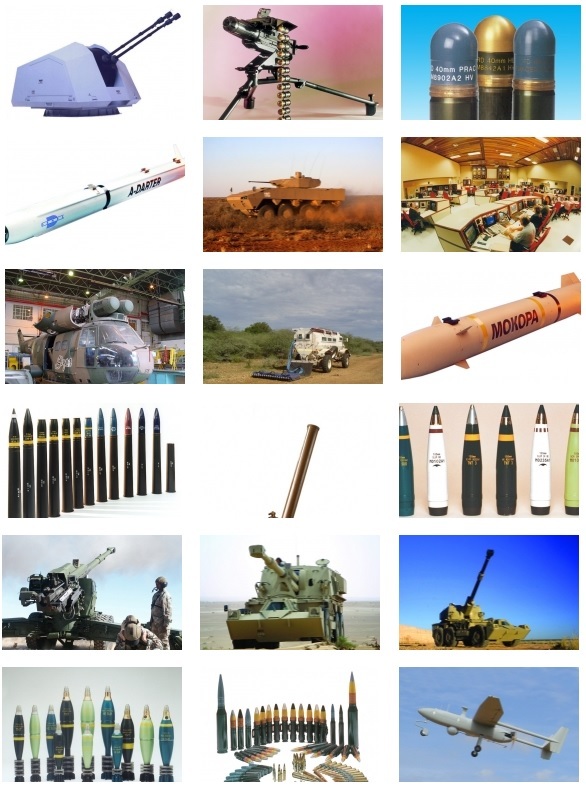 Denel provides turn-key solutions of defence equipment to its clients by designing, developing, integrating and supporting artillery, munitions, missiles, aero structures, aircraft maintenance, unmanned aerial vehicle systems and optical payloads based on high-end technology. Its defence capabilities date back more than 70 years when some of Denel's first manufacturing plants were established. Between the Denel divisions there is a collective experience of over 200 years. Over the years Denel has built a reputation as a reliable supplier to its many international clients. It supplies systems and consumables to end users as well as sub-systems and components to its industrial client base. Denel also has a number of equity partnerships, joint ventures and cooperation agreements with renowned international players in the defence industry. Denel Aerostructures (DAe) world-class facility specialises in advanced manufacturing of complex aerostructures, making the division a recognised leader in the aerospace industry. As the first company in Africa to be NADCAP-accredited across multiple technology disciplines, Denel Aerostructures' reputation extends internationally to various aircraft OEMs (Original Equipment Manufacturers). Established in 1964, Denel Aerostructures has risen to prominence to the extent that it is now the largest aerostructures facility in Africa. Their capabilities include comprehensive design, industrialisation, advanced manufacturing and the assembly of ultra-light weight aerostructures for the global aerospace market. Denel Aviation is primarily a maintenance repair and overhaul (MRO) company for fixed and rotary wing aircraft including mechanical and avionic components. The company also provides systems integration, upgrades and retrofit installations. As a strategic partner to the South African Air Force (SAAF), the company has provided support to the SAAF for 50 years and has expanded off this capability base to support the African continent and selected markets worldwide. The company is the Original Equipment Manufacturer (OEM) of the SAAF Rooivalk combat support helicopter, Design Authority of the SAAF unique Oryx medium transport helicopter and assigned as Design Authority of the Cheetah (Mirage variant) fighter aircraft. Denel Aviation was responsible for the final assembly of the BAE Hawk lead in fighter trainer for the SAAF and to this day continues to support the aircraft in operation within the SAAF. Denel Dynamics is an innovative leader in advanced systems technology. Its core business includes tactical missiles, precision guided weapons, unmanned aerial vehicle systems, integrated systems and space solutions. The company’s products are designed, developed and manufactured in South Africa. Denel Dynamics is a strategic partner of the South African National Defence Force. The company also promotes collaboration and partnerships with other developing nations such as Brazil and the United Arab Emirates. Denel Dynamics products are also in service with other defence forces in Africa, the Middle East, Europe, Asia and South America. Denel Integrated Systems & Maritime (DENEL ISM) was established in December 2014 as the seventh division of Denel SOC Ltd. The purpose for its establishment was to give immediate effect to calls made in the Defence Review 2014 for the Denel Group to establish a Maritime and Defence Sovereign capability. DENEL ISM focuses on three key markets: Defence Sovereign, Maritime and National and Civil Security. Denel ISM has established sovereign capability in areas such as System Integration, Air Defence, Command & Control, Electronic Warfare and Secured Communication. Denel ISM supports the South African Navy with Systems Integration capability and will work to improve the SA Navy's operational availability through its depth of maintenance and upkeep experience. Denel ISM is the Trusted Sovereign Technology Partner to the SANDF and to the National Security Agencies. Denel ISM contributes to Operation Phakisa's objective of growing the ocean economy by supporting peace and security in the region. Denel Land Systems is a diversified high-tech industrial group registered under the South African Companies Act, with the State as the sole shareholder. Denel Group was formed in 1992 when most of the subsidiaries of Armscor, the State armaments procurement agent, were regrouped into a commercial company. Denel Land Systems is a world leader in the design and manufacturing of towed and self-propelled artillery weapons, infantry systems, combat turrets and a range of infantry weapons. The capability to define, design and integrate these systems with small, medium and large calibre guns has been established over more than 30 years of practical experience and battlefield feedback. This has led to world class products such as: G5 155 mm Towed Artillery System; G6 155 mm Self-Propelled Artillery System; Rooikat 76 mm and LMT 105 mm Armour Combat Turrets; Olifant 1B Optimised Tank Turret; 12,7 mm, 20 mm, and 35 mm Light Combat Turrets; 35 mm Air Defence and Naval Turrets; The New Generation Infantry Combat Vehicle System (Badger); A range of Infantry Weapons such as the SS77 General Purpose Machine Gun, 40mm Automatic Grenade Launcher, NTW 20 Anti-material Rifle, 60mm and 81mm Mortars. Denel MECHEM had its origins as the Applied Chemistry Unit (ACU) of the CSIR (Counsel for Scientific and Industrial Research of South Africa) tasked with research and development of mechanical and chemical solutions to defence related problems giving way to the name MECHEM. The cessation of the border war in the 1980s saw MECHEM changing its focus from largely R&D to demining and started commercial demining in 1991. MECHEM activities include: Explosive Remnants of War (ERW) Clearance Solutions; Specialised Canine Products and Services; Mine Protected Vehicles; Ancillary Equipment; Related Skills Development. The experience gained from hundreds of tests since its establishment in the mid-eighties has confirmed the Test Ranges ability to manage and execute any combination of air, ground and sea flight tests. With key features like an unrestricted test arena with appropriate topography; an instrumentation suite with ISO9001:2008 quality certification, a variety of target services and guaranteed security of test data Denel Overberg Test Range offers a professional, cost-effective turn-key solution to its clients. In addition to the Test Ranges proven track record, its availability throughout the year, mild Mediterranean weather conditions, optimized test execution doctrines, instrumentation deployment flexibility and experienced professionals make Denel Overberg Test Range one of the top in the world. Denel Pretoria Metal Pressings, popularly known as PMP, is an integrated manufacturer of small and medium calibre ammunition, brass products, detonics, power cartridges and mining drill-bits. Based in Pretoria West, Denel PMP employs about 1 000 people. Denel PMP holds the ISO 9001 certification for quality, ISO 14001 for high environmental standards and OHSAS 18001 for occupational health and safety. A major portion of Denel PMPs turnover is through exports, making the company a valuable earner of foreign exchange. The company has been supplying quality products to military and police forces, and to the hunting and sporting associations around the world, for more than 70 years. During World War II, Denel PMP produced around 45% of the 303 rounds used by the World Allied Forces, amounting to a total of 768 million rounds at the end of the war. Courses are approved and accredited by the South African Civil Aviation Authority (SACAA), the Transport Education and Training Authority (TETA) and the Manufacturing, Engineering and Related Services Training Authority (merSETA) to offer training in accordance with the Competency-Based Modular Training system. This ensures that apprentices are adequately trained, both practically and theoretically, to allow them to continue with workplace training to qualify as artisans. Denel Vehicle Systems is the Original Equipment Manufacturer (OEM) of a wide range of highly effective armoured vehicles such as: Main Battle Tank like the Olifant; Heavy Wheeled Armoured Vehicles (such as the Rooikat Armoured Car and the weapon platform for the G-6 SP Howitzer); Light Armoured Vehicles (RG-32M Mine-hardened Patrol Vehicle); Mine-protected Vehicles (such as Mamba, RG21, RG-31, RG35, RG41); Police and Security Vehicles (such as RG-12 Nyala) . DeniProp provides tailor-made infrastructure solutions to Denel's operating divisions and associate companies, as well as to a broad range of external tenants. Services include corporate real estate management, property management and facility management (FM) services. An extended range of FM services including plant maintenance, estate management, security, catering, cleaning, waste management, industrial health and fire services are provided to, or managed on behalf of tenants.